Try our Potato-Parsnip Latkes Recipe if you like to sneak in the veggies when no one's looking. Parsnips add a touch of sweetness to this latkes recipe. Grate potatoes and parsnips using large holes of box grater; place on center of large clean kitchen towel. Bring up ends of towel and twist together to form a pouch. Holding pouch over sink, squeeze out excess moisture from vegetables. Place vegetable mixture in large bowl. Add onions, egg, flour, 2 Tbsp. of the dill weed, the salt and pepper; mix well. Heat oil in medium nonstick skillet on medium-high heat. For each latke, carefully spoon 1 tablespoonful of the vegetable mixture into skillet, cooking two to three latkes at a time. Immediately spread each mound into thin circle with back of spoon. Cook 3 to 4 min. on each side or until golden brown on both sides. Remove latkes from skillet; drain on paper towels. Repeat with remaining vegetable mixture. 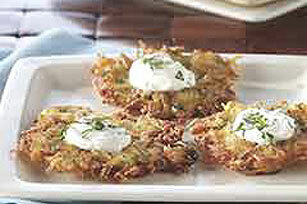 Serve each latke topped with 1 tsp. of the sour cream. Sprinkle evenly with remaining 1 Tbsp. dill weed. Latkes can be prepared ahead. Cover and refrigerate until ready to serve. To reheat, place in shallow baking pan and bake at 350°F for 10 min. or until heated through. Substitute 3 Tbsp. matzo meal for the 2 Tbsp. flour. Substitute 1 Tbsp. dried dill weed for the fresh dill. Makes about 2 doz. or 8 servings, three latkes each.